Address: 6201 N. Suncoast Blvd. Crystal River, known as the "Home of the Manatee," is located approximately 67 miles north of Tampa on Florida's beautiful Nature Coast-a place where more than half of the land is designated as state/federal lands and parks. This is the ideal place to swim with manatee, kayak natural crystal-clear waters, golf to your heart's content, bike or hike meandering trails, fish for trout, redfish, shark, bonefish or tarpon, and to dine at one of more than 30 on-the-water restaurants in the area. A growing community with a wonderful family-friendly ambiance and warm hospitality, Crystal River is, indeed, the "gem of the Nature Coast. 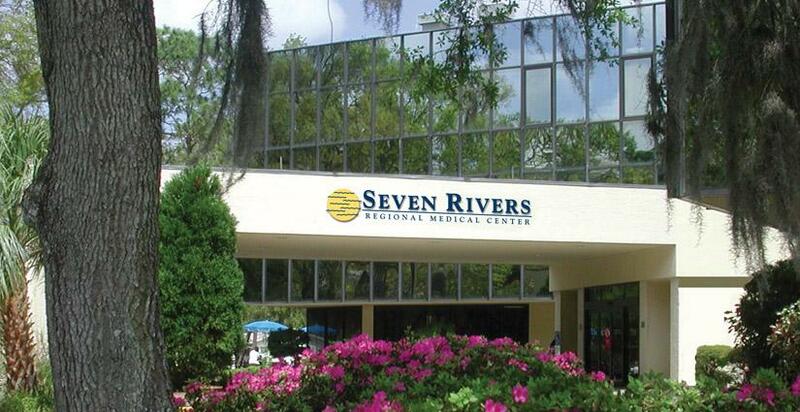 Seven Rivers Regional Medical Center is a 128-bed, general medical/surgical, acute-care facility serving the communities of Citrus, Levy and South Marion counties. Seven Rivers Regional is fully accredited by The Joint Commission and has earned the Gold Seal of Approval from The Joint Commission as a certified primary stroke center. The facility has earned awards from: AHA/ASA - Get With The Guidelines; Florida Medical Quality Assurance, Inc. , Medicare projects in pneumonia and surgical care improvement; and Thomson Reuters Top 100 Hospitals (1999, 2001) and Top 100 Hospitals for Stroke (2000).